With a geeky Euro beer list and Bavarian pretzels, Prost crew gives PDX a new German lesson. There are only a few places in the city to get your lederhosen fix: Otto’s or Edelweiss for cured meats; Rheinlander for kitschy family feasts; Grüner for fancy Alpine cuisine. 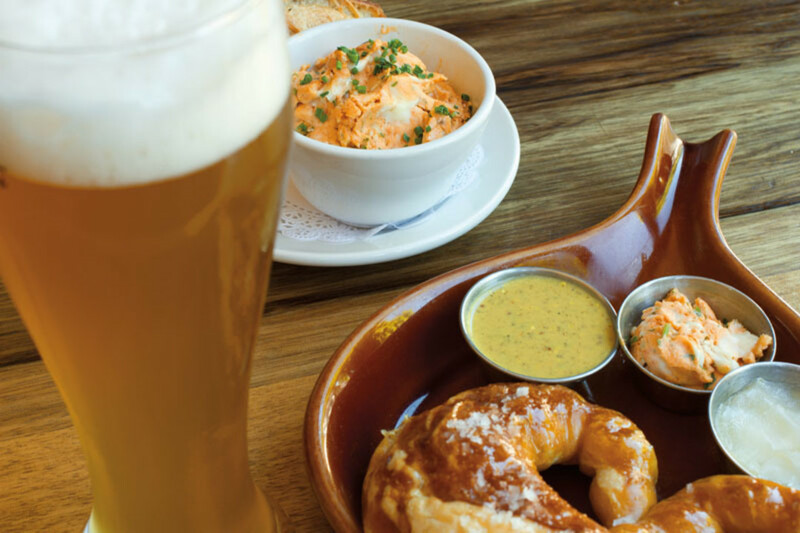 Now Stammtisch, a beer hall from the folks behind North Portland’s Prost, is luring bierstube enthusiasts deeper into the world of Germanic brews while raising the bar for the country’s comforting cuisine. Stammtisch’s airy, recently overhauled space along NE 28th Avenue (last home to Spints Alehouse) now includes a bar that wraps around into an expanded second room, a huge accordion window in front, and a soon-to-be-christened sidewalk beer garden with an extra 30 seats. The impressive, rotating 18-tap beer list ranges from a rare, malty maibock to a smoked helles lager. “I want to expand people’s horizons,” explains owner Dan Hart, “to let them experience craft beers they might only find in tiny towns in Bavaria.” The selection is plenty dorky for most Euro beer snobs but accessible enough for the casual drinker. The full-length menu, from former St. Jack sous-chef Graham Chaney, sets Stammtisch apart from Prost’s sausage-centric, snack-heavy offerings. It’s a step up in execution from most German fare in town, albeit through the lens of a French-trained chef. You’ll find classic schnitzels and a Bavarian pretzel, along with less common maultaschen (big Germanic rolled pasta) and obatzda (a paprika-spiced Camembert cheese spread), and an addictively smoky roasted chicken with thick-sliced, fat-soaked potatoes. But skip the house-made weisswurst, which scarcely resembles the traditionally paper-white, mace-spiced sausage, and steer clear of the Wiener schnitzel—closer to an oily, deep-fried bear rug than the Austrian icon. The line between authenticity and caricature is fine, and Stamm-tisch straddles it well. It’s nostalgic for expats, edifying for the uninitiated, and—if they can nail down their German kitchen—delicious for everyone else.